A great day for a bike ride. Seriously, we live for this stuff. Raining, cold & wind. OK, wouldn’t mind a bit warmer. But you gotta take what comes and make the best of it. And yes, the temp is showing 39.6 degrees. It’s been some time since I ride didn’t just live up to its billing, but surpassed it. 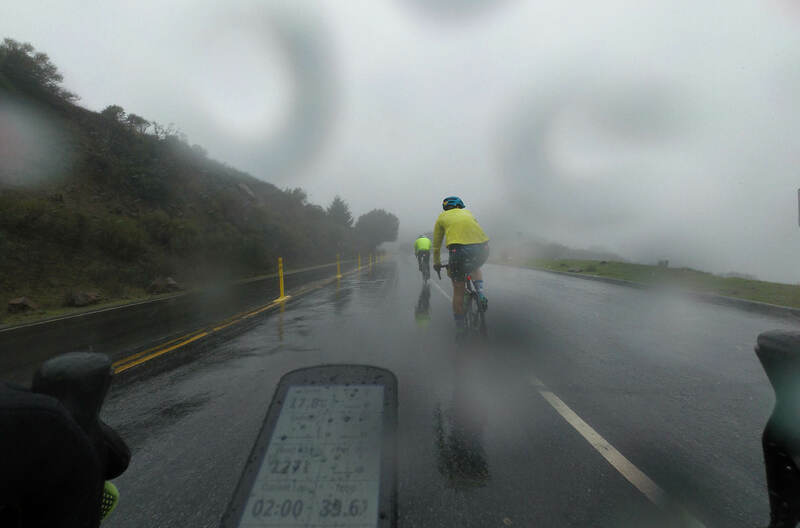 We’ve been watching the weather for some time, and had resigned ourselves to nothing better than a wet & messy ride this morning, as the “big storm” continued to wimp out. There’s been a consistent pattern; a day or two out, it looks like we’ll be riding in epic weather, but as you get down to the wire, starting about 8 hours out, the hourly forecast becomes less and less severe. And so it was this morning, as Kevin and I were getting ready to leave for a 9:15 redezvous with Kevin (pilot), that the hourly forecast showed… well, no rain at all between 10 & 1pm. That’s the worst. Messy wet road that trash your bike and sap your spirit. But today, that didn’t happen. The Bridge of Death at the start of the West Alpine climb. We got to show Lo the Duck Pond detour and then head up West Alpine. 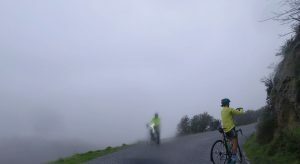 It was pretty clear that she’d just been riding easy up Old LaHonda when we caught up to her; the pace increased significantly on West Alpine. Easy for Kevin but I was pretty maxxed out, although I might have been able to do a bit better if I wasn’t trying to be tell Lo about the roads we ride. And also find out that she’s done some racing, a gravel ride across Wisconsin that sounded pretty intense, and later, looking at her Strava profile, seeing that she’s got a ton of QOMs. Serious rider and seriously nice person. Very much enjoyed riding with her. 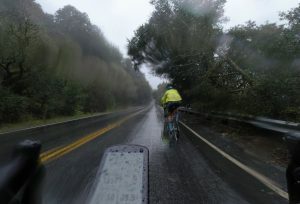 There just aren’t that many crazy people who really enjoy riding in weather like this. Check out the tree blowing down on the right. Parts of Skyline were pretty crazy, with some really strong sidewinds while the rain was coming down. 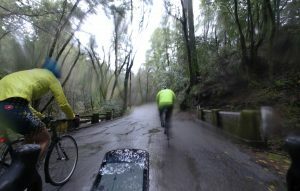 Thankfully nobody got blown over, and glad I’ve got all-weather tires that offer more traction in wet conditions. And disc brakes, too, which she didn’t have on her bike. What else didn’t she have? Leg warmers. Could not believe she’d be comfortable like that, but she is from Seattle after all. She peeled off in Woodside and headed to her hotel in Menlo Park, and I’m sure spent some serious time in a hot shower warming up cold legs. Kevin and I arrived home soaked, tired & happy. Couldn’t ask for more than that.